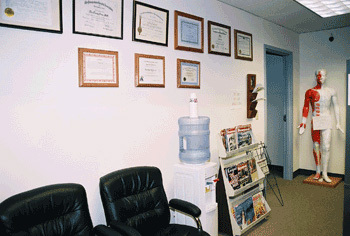 Your first acupuncture visit will be similar to a first visit with a Western doctor. The visit starts with filling out medical history forms. It is important to answer all questions on the forms accurately to assist the medical staff in evaluating your condition. Acupuncture is part of “Traditional Chinese Medicine,” which is typically a more holistic approach than Western medicine. You will be asked questions about your emotions, sleeping patterns, ability to tolerate heat and cold, current diet, etc. These questions may seem unrelated to your reason for making the visit. However, they are often important to your diagnosis. After filling out the forms, we will do the customary stethoscope routine. You will have an opportunity to verbally describe your condition. We may opt to do a more extensive tongue examination and a Chinese pulse examination. The Chinese pulse examination is a major diagnosis technique for traditional Chinese medicine. It is a method of establishing the condition of the “meridians” or pathways of “qi” (energy) within your body. After reviewing your records, our acupuncturist will provide a diagnosis. Our acupuncturist will determine the “cause” of the symptoms that you have described (the reason for your visit). Needles will then be inserted into very specific acu-points that will help bring the body back into “homeostatis” or balance, thus removing the source of the symptoms. As with any treatment plan, make sure that your questions are answered to your satisfaction. We want to make sure the treatment plan seems reasonable based on your condition. If you have tried everything else for many years with no progress, it may take more than a single visit to an acupuncturist to see results. While multiple visits may be necessary, you do not want to make an acupuncture treatment a weekly event for the rest of your life to heal a sore elbow. We will be honest with you and tell you what we feel should be the number of visits it will take to help your condition. If you have no previous experience with Chinese culture or medicine, be prepared for a cultural experience. This experience will not only relieve your medical condition, but also enrich your life. Make sure you ask questions if you don’t understand something. Allow at least an hour for the first visit. The actual treatment will last around 30 to 40 minutes. It may take several visits to make progress depending on the seriousness of the condition and the length of time it has been causing you discomfort. During treatment, people may experience acupuncture differently. Most feel no or minimal pain as the needles are inserted. The treatment goal is the restoration and balance of the body’s Qi. Some patients will experience a burst of energy while others may feel relaxed or even tired. Many people experience a sense of calm and well being. Small, localized bruises from minor bleeding under the skin are rare but do happen. These are no cause for alarm. Despite the cosmetic inconvenience, they actually provide a kind of bonus treatment. The re-absorption of the blood continues the stimulation of the acupuncture point even without the presence of the needle. Most new clients may feel afraid of the use of needles. Actually, the pain from acupuncture is much less than Western injection. In Western medicine, needles are used to inject medicine or to withdraw fluids from the body. The needles are hollow and the tip is beveled and sharpened so that it can cut the skin upon entry. In comparison to Acupuncture needles, Western needles are huge because the diameter needs to be large enough to transfer the thick fluids of the body. Acupuncture needles are very thin and solid. They are not designed to cut the skin, but to displace the skin and stimulate areas beneath the skin. 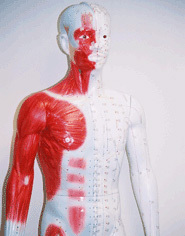 Therefore, you will feel no or minimal pain from acupuncture needles. We use brand new disposable needles taken from a sealed package for each patient each time. The needles are usually inserted by placing them in a “tube-like” holder to keep them from bending upon insertion. The acupuncturist will then “tap” the top of the holder to insert the thin needle to the desired depth. The holder is then removed, leaving the actual needle in place. The needles are left in place for a prescribed period of time (up to 30 minutes) before removal. Depending on the treatment plan, from one to several dozen needles could be inserted in various points. Throughout treatment, our acupuncturist may adjust the needles by turning them gently. Turning does not insert the needle any deeper into the skin. It is purely for stimulation purposes only. Turning does not cause pain. While turning the needles, you will be asked if you feel a slight pressure. When you do, the acupuncturist will stop turning the needle.